I’m not sure what twisted brain thought this strange little speaker up, but the designer would have to be seriously deranged. It could be that this is designed after a particular movie or fantasy creature, but it doesn’t seem to be. Really it looks like a Teletubby mated with an alien dog. Yes, speakers are necessary, but do they have to be quite so terrifying?! Not only does it have that evil stare, they made it pink. Luckily though, the little speaker is very cheap. Which means at a low price you can terrify any guest and make your friends stop calling you. Then again, that could be good if you’re trying to work yourself up to the point of becoming a hermit. With as cheap as it is, it’s highly doubtful that the quality of sound will be that great. It measures 3.54in x 2.36in x 4.72in. You can pick it up for $5.85 on Deal Extreme. 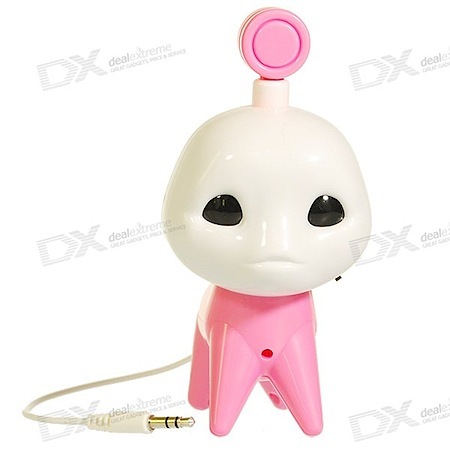 this is actually an alien from a chinese movie CJ7, hence the name. The alien in the movie was green and male, which also explains why this alien is pink. Thanks for the input, Alex Baron and Pigeon. If you want to watch other movies by Stephen Chow who starred in CJ7 as well (did you know the “boy” in the movie is actually a girl in real life? ), do check out Kung Fu Hustle and Shaolin Soccer – those are the more modern hilarious ones although he has had some crazy stuff earlier on as well. Yeah she had me fooled, too! Never really understood the whole appeal of CJ7, apparently Stephen Chow designed the alien dog himself.